Unfortunately for the Canon IXUS 140, other similarly-specced cameras - including its own sibling the Canon IXUS 125 HS - just work better in a greater range of scenarios. Budget point-and-shoot cameras are facing tough times from the ever increasing abilities of smartphone cameras, but if there's any compact camera that can still cut it in this cut-throat sector, it's likely to be from the successful Canon IXUS range. The Canon IXUS 140 - known as the Canon PowerShot ELPH 130 in the US - is positioned as an entry-level camera, pairing a 16 megapixel CCD sensor with a fast Digic 4 processor. Out front there's an 8x optical zoom lens sporting a useful 28-224mm equivalent range in 35mm terms, along with Canon's accomplished Intelligent IS optical image stabilisation system. Although blessed with plenty of megapixels, the sensor isn't classed as an 'HS' - or high sensitivity - design in the IXUS range. Consequently, maximum sensitivity tops out at a relatively disappointing ISO 1600, making image stabilisation vital for taking steady shots in low light. Smart Auto boasts 32 scene modes for shooting still images, and 21 modes that can be applied to movie recording. At this price point there's no touchscreen on offer, but instead you do get Wi-Fi connectivity to make it as easy as possible to share those precious memories. Hook the Canon IXUS 140 up to your smartphone and the camera can also piggy back off your phone's GPS to geotag your shots. Naturally HD video capture is catered for, albeit at 720p resolution rather than Full HD 1080p. You'll want to ration video usage though, since battery life is restricted to around 190 shots per charge. Fortunately Canon's Eco mode can preserve enough power to eek this out to 260 shots. Priced at £159/US$199 (around AU$231), the Canon IXUS 140/PowerShot ELPH 130 is very affordable, and sits in the same price bracket as the Nikon Coolpix S6400 and Pentax Optio RZ18. Design wise we're talking classic Canon IXUS. 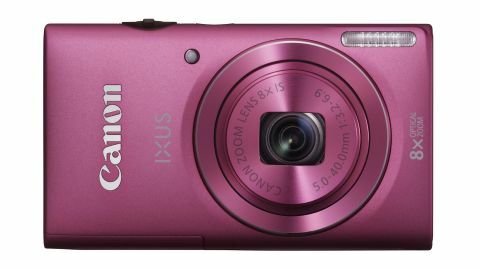 The Canon IXUS 140 is petite, minimalist and beautifully put together in a svelte metal shell. Despite the metal body, it still weighs in at a modest 133g/4.69oz when loaded and ready to shoot and measures 95.4 x 56 x 20.6mm (3.76 x 2.2 x 8.11 inches). This makes it smaller than an iPhone 4S - albeit thicker - so it'll easily nestle in a shirt pocket or clutch bag. Plus it's available in black, silver, red or pink, so there should even be a colour option to match your outfit. Downsides? Well the Canon IXUS 140's sleek matt finish and the lack of a rear thumb grip means this is a worryingly easy camera to drop, especially because you'll probably be struggling to prod the small, recessed rear buttons at the time. These include dedicated video record and playback buttons, the usual menu, display, flash and macro controls and a single switch to toggle between Smart Auto capture or programmable mode. The rest of the rear panel is dominated by a 3-inch PureColor II G LCD display with 460,000-dot resolution. Menus are clear and simple even if the monitor isn't always bright enough to accurately assess exposure in sunny conditions. At least the screen's viewing angles are top notch, though. The Canon IXUS 140/PowerShot ELPH 130 bursts into life in around two seconds, and thanks to a fast autofocus system it wastes no time in capturing the moment. Stick it in Smart Auto mode and the compact camera takes most shooting conditions in its stride, reliably detecting a moving subject, automatically switching to macro mode for close-up shots or raising the sensitivity to avoid camera shake when zoomed in. There are 32 scene settings available, with effects including Fish-Eye Effect, Miniature Effect, Toy Camera Effect, Monochrome, Super Vivid, Poster Effect, Color Accent and Color Swap. There are also modes for Portrait, Low Light, Smart Shutter (Smile, Wink Self-Timer, Face Self-Timer), Snow and Fireworks. Canon's i-Contrast feature gives dynamic range a boost too, though on a bright day you'll have to trust this, since the LCD monitor doesn't do a great job of displaying highlight or shadow detail. In good lighting, exposure metering is generally bang on, however when the going gets dim and you'd rather not ruin the mood with flash, the Canon IXUS 140 is prone to underexpose. Part of the problem is an unwavering resistance to using maximum ISO 1600 sensitivity when set to auto ISO. Manually select the highest sensitivity and it becomes clear why Canon would far rather the flash took over in low light. Both grain noise and colour speckling are easily noticeable and smear fine detail in their wake. The problem isn't terrible, but plenty of comparable cameras perform better at the same settings. The Canon IXUS 140's Wi-Fi connectivity is more appealing, though. Sure, it's nowhere near as streamlined or feature-packed as say the Samsung Galaxy Camera's system, but then the Canon IXUS 140 is much cheaper. What you do get is reasonably simple and effective photo sharing to computers or mobile devices, or direct to your photo printer. These days, run of the mill compact cameras have to either perform very well indeed or at least offer some special features to earn their keep. While the Canon IXUS 140/PowerShot ELPH 130 makes a case for itself with its wireless connectivity and fairly versatile 8x zoom lens, it left us underwhelmed in the image quality department. Topping out at ISO 1600 would be just about acceptable if images were fairly clean at this sensitivity, but the level of image noise produced by the Canon IXUS 140 at ISO 800 and above can be distracting. Granted, in good light the camera takes a decent enough shot and can be a pleasure to use, but so too is the similarly priced and just as attractive-looking Canon IXUS 125 HS. Yet this camera won't do a wobbly when the sun goes down, thanks to a high sensitivity 16MP sensor that produces noticeably cleaner shots right up to ISO 3200. If you can make do with a 5x optical zoom range and forgo wireless connectivity, then the Canon IXUS 125 HS gives you all the IXUS design flair with far fewer image quality shortcomings. The Canon IXUS 140 benefits from the legendary IXUS build quality and sleek design, and it puts in a snappy and satisfying performance in decent light. However, its low light performance is disappointing. The sleek, matt compact camera is also easy to drop if you use it without the wrist strap. Although the Canon IXUS 140 is a perfectly adequate camera in most situations, the same can said of many high-end smartphone cameras. If you're going to allocate precious pocket or bag space for a dedicated camera, then it must take much cleaner shots after dark, even at this price point.